As Christian Fiore showed members of Civil Air Patrol’s (CAP) Nashua (New Hampshire) Composite Squadron the capabilities that live in MITRE’s Reconfigurable Cockpit Avionics Testbed (RCAT) Lab, the cadets weren't sure what they were seeing was work or play. But at least some of them knew they wanted to get in on it. "A lot of the kids seemed really interested in ‘How do I get to do this? This is really cool. It seems like you guys basically get to play at work all day," says Fiore, lead avionics systems engineer for MITRE's Air Force program. But Fiore is quick to emphasize the road to that kind of career is more than fun and games. "We really kind of hit home that this is why your parents tell you to pay attention in school," he says. "If you want to do these types of things at work, you need to invest the time in math and science." 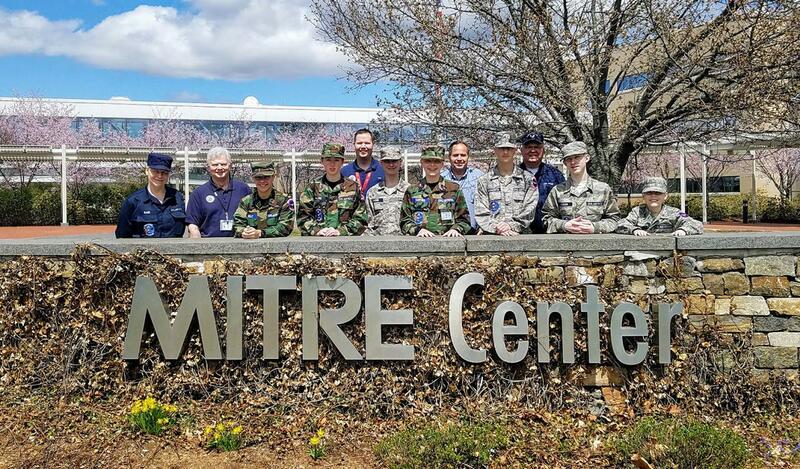 The chance to deliver that message moved Fiore to invite 15 members of the CAP Nashua Composite Squadron to MITRE’s Bedford, Massachusetts, campus. For Fiore, the CAP (the official auxiliary of the U.S. Air Force) is a family affair. His 12-year-old son is a member of the same squadron he joined as a teenager and now advises as a volunteer. During their MITRE visit, the cadets got a taste of what flying military aircraft is like, along with the science that makes it possible for MITRE engineers to recreate that experience. "This was a great group of kids," says Jeff Higginson of MITRE's Air Force Programs Center. "They were all very outgoing, and obviously interested in aviation already. It was a chance to show them a little bit about what's available at the company and the kind of work we do that makes the world safer. They also got to meet and talk to guys like Christian, who are very motivational." The visit is just one of the many activities involving our employees support of STEM (science, technology, engineering, and mathematics) studies from grade school onward. During their four-hour MITRE visit, cadets tried out both the RCAT's flight simulators—one designed to emulate tactical aircraft and another for mobility. It was a new dimension for the cadets. They sometimes fly gliders and powered aircraft, but haven't been exposed to military aircraft or the science behind the simulations. When they weren’t sitting in the flight simulators, they talked and listened to MITRE staffers Amy Baker, Robert Edwards, and Keith Miller as they described the work they do in the RCAT Lab. Higginson believes it was time well spent. "If we can encourage even one of these kids to be a little bit more aggressive about taking an extra science course or pursuing a career in engineering or science, it's a really rewarding thing for us to do," he says. "I really enjoy the work I do," Fiore adds. "I'm pretty happy and privileged that I get the chance to come to work and kind of geek out on all these exciting work areas. So anytime I can share that with somebody, I think it's a good thing." And Fiore got what may have been the ultimate validation in the parting words of his own son as the tour ended: "Dad, you’ve got a pretty cool job."